Warrenpoint Town boss Stephen McDonnell. Pic by Pacemaker. The Boxing Day clash between Warrenpoint Town and Newry City has more than just local pride at stake. With only three points separating the two sides this game is your veritable ‘six pointer’! Newry City AFC boss Darren Mullen. Pic by Pacemaker.Newry City AFC boss Darren Mullen. Pic by Pacemaker. Warrenpoint’s defeat at Seaview makes the Boxing Day derby dust-up with Newry City a red-letter Danske Bank Premiership game. “ After this defeat we will regroup and were back in on Monday morning preparing for the Newry game,” said Point boss Stephen McDonnell. “After the defeat at Crusaders it has become more massive than ever. “It’s a six-pointer and if we win we go six clear so that is the opportunity that has presented itself. “These are the games which are going to keep you in the league so you cannot minimise their importance. Newry have a game in hand on their neighbours following the postponement of Friday night’s game against Glentoran after the match officials were involved in a road traffic accident as they made their way to the ground. City boss Darren Mullen is relishing the big game at Milltown. “We have a busy schedule coming up over Christmas, but that’s the healthy sacrifice you have to make,” said the Newry manager. “The Boxing Day game is obviously a big one. “There’s a great buzz about the area, fans of both clubs are looking forward to it. “It’s great to be involved in big games over the festive period as it’s not too long ago that we weren’t even playing over Christmas. 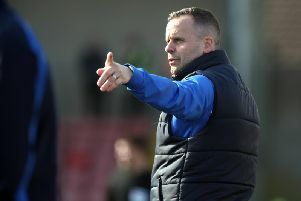 “Managing in the Danske Bank Premiership is non-stop and you honestly don’t have a minute. “There’s also added pressure and expectation, but this is where we always wanted to be.